Eric relayed the following story to me when they picked me up after work. So many things about this are amazing, the impulse control, the quiet voice, the polite requests and acceptance of the refusals…but NONE of those are as amazing to me as this. Someone said no to C.A.L.E.B. CALEB! Want to see something else amazing? 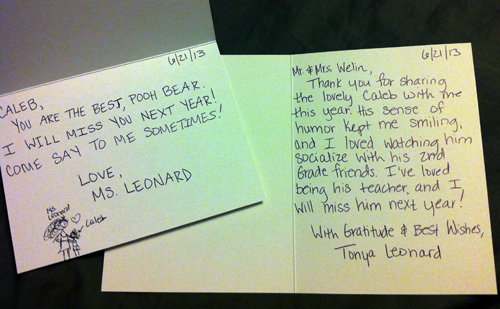 A thank you note to us and an I’ll miss you note to Caleb from his teacher. And this is his gen ed teacher, not the one who came to hang out with him for a few extra hours in her spare time…yeah, he’s a pretty special kid. Shante’ Nicole Barnes liked this on Facebook. Jayme Hundley Haney liked this on Facebook. Tina Makris liked this on Facebook. Michelle Pariseau liked this on Facebook. Elizabeth Bit Overstreet liked this on Facebook. LOVE this post. Such wonderful teachers! Jeanie Calenoff liked this on Facebook. Debbie Pena liked this on Facebook. Maria Gravalese Street liked this on Facebook. Yes, he is and you and Eric are special parents! Loraine Brown Barrieau liked this on Facebook. Rachelle Skoruppa Gatewood liked this on Facebook.